The first thing you'll need to do is create an application in Kumulos. This is a way of organising your projects in Kumulos, and it should relate to the mobile app you're building. Let's get started now. Now we'll go through the steplets involved in creating your app. a - What is your app called? Start by entering the title of your app. It has to be unique across your account, and should be meaningful to the project you're working on. Upload an icon that will be displayed on the main dashboard and the app's dashboard. This will be used if your app is featured anywhere, and it makes your apps easier to find as you start adding more. 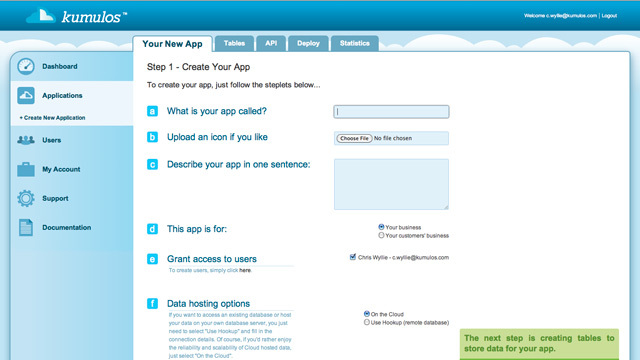 You can give your app a brief description that will be displayed on the app's dashboard. Indicate whether the app is a project you're undertaking for yourself, or for one of your clients. This steplet is to encourage you to think of how to monetise your app. If it's for a client's business, you should consider the some of the business models you use to maximise your return on the project. 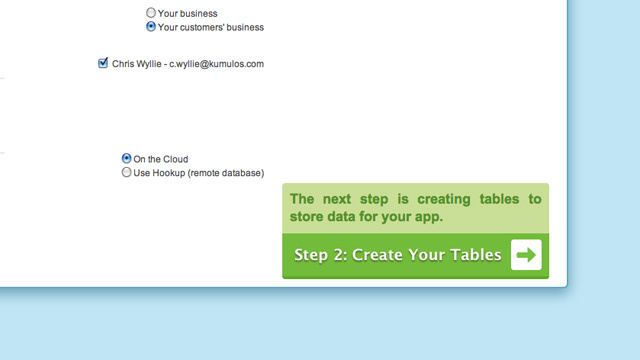 Now you can select which Kumulos users on your account will be able to work with your app. Their access will be restricted in accordance with their given permissions. For example, this would allow you to give your client access to their data without the development tools. The last steplet in creating an app is to decide where you'd like your data hosted. 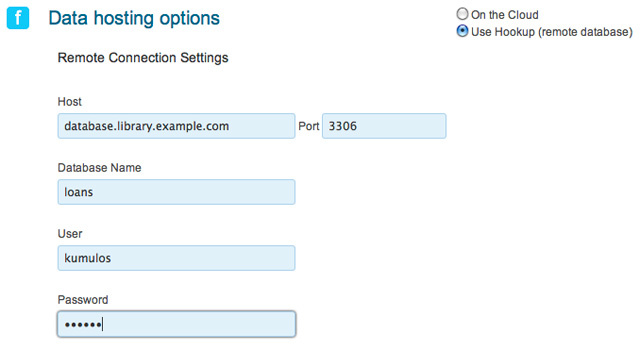 You can select "On the Cloud", or "Use Hookup". Our cloud hosting option is one of the easiest. Your data will be stored in our secure, managed data centre and it requires no setup on your part. Alternatively, if you have an existing MySQL database or your own database server, you can connect Kumulos to it and store your app's data there. Setting up Hookup is covered in more detail in our Hookup introduction.